The North West region of the Nubian plate is a geographically large area and encompasses the North West region of the African continent and a large chunk of the Atlantic Ocean (Figure 1). It is characterized by a wide variety of tectonic interactions and geologic features along its boundary with adjacent plates. Figure 1: On Nubia's western flank, extension is occurring at the Middle Atlantic (MAR) and Terceira ridges, which then transitions via a triple junction at the Azores (between Africa, Eurasia, and North America), to the Gloria transform fault (Serpelloni et al., 2007)(McClusky et al., 2003). This fault extends to the Mediterranean, where continental lithosphere comes into play, and the tectonic interactions become complex due to the collision of Africa and Eurasia (Vernant et al., 2010). Modified after McClusky et al., 2003. The African continent is composed of (Figure 2) a crystalline, Precambrian basement of meta-sedimentary, meta-igneous, and igneous rocks – within which, granitic-gneissic greenstone belts of Archean cratons are surrounded by Proterozoic orogenic provinces (Schlüter and Trauth, 2008). Un-metamorphosed cover rocks of Archean and Palaeoproterozoic aged sedimentary and volcanic sequences overlie the Precambrian basement (Schlüter and Trauth, 2008). The cratons in the North West region are also extensively covered in some regions by unconsolidated Cenozoic deposits (Schlüter and Trauth, 2008). Figure 2: Geology of the African continent. From Schlüter and Trauth, 2008. The portion of the Nubian plate under the Atlantic Ocean contains some of the oldest oceanic lithosphere (~180 Ma) on the Earth (except for a region in the South Pacific)(Wang et al., 2011). 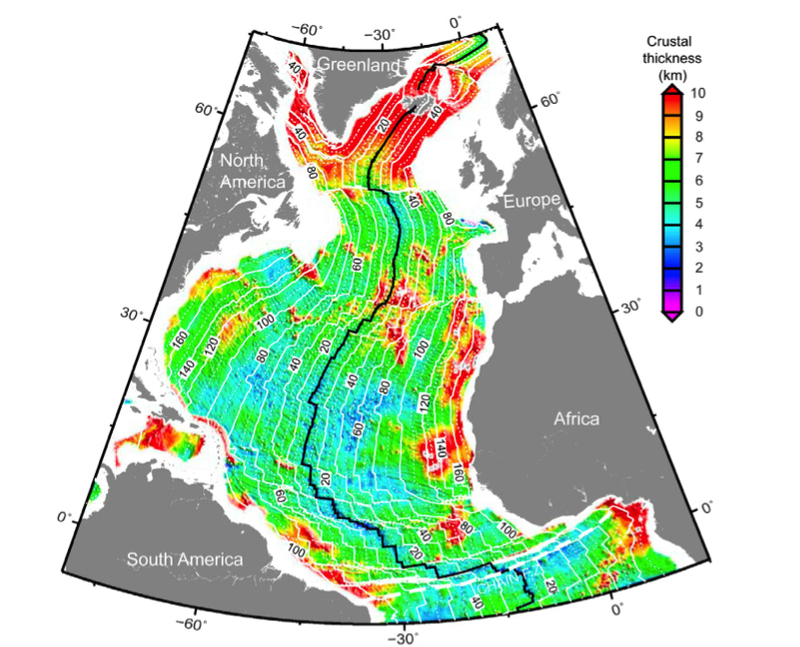 At the Mid-Atlantic Ridge (MAR), active upwelling of basaltic magma creates new oceanic crust in an extensional setting (a spreading centre) (Wang et al., 2011). It is characterized by a slow-spreading regime at the MAR and is therefore thought to be a magma-limited environment (Wang et al., 2011). Whereas, at regions where there is enhanced upwelling of magma (due to a hot spot), such as at the Azores, the region is characterized by elevated topography, a pronounced negative Bouguer anomaly, and enriched mantle chemical compositions (Figure 3) (Wang et al., 2011). Figure 3: Map of crustal thickness based on residual mantle Bouguer anomalies in the Atlantic Ocean. Note the thick crust at hot spot regions, such as the Azores. From Wang et al., 2011. The breakup of Gondwana ~200 Ma marks the beginning of the interaction between North Africa and Eurasia (Zitellini et al., 2009). During the Jurassic, Africa and Iberia separated and the formation of their continental shelves commenced – although, Western-Iberia only separated from North America in the Cretaceous (Zitellini et al., 2009). Between 118-84 Ma, Iberia moved independently from both Africa and Eurasia, subsequently becoming welded to Africa (Zitellini et al., 2009). At 35 Ma, the boundary between Iberia and Africa became active again, with the modern day arrangement coming to fruition at ~ 20Ma (Zitellini et al., 2009). During the Middle to Late Miocene (~10 Ma), active continental collision between Nubia and Eurasia commenced as the Neotethys closed between Arabia and Eurasia due to subduction (Video 1) (McClusky et al., 2003). Since the Oligocene (~40 Ma), the western Mediterranean has accommodated 150-170 km of plate convergence (McClusky et al., 2003). From the Early Miocene (~20 Ma) to the present, the western Mediterranean has had a complex history with adjacent compression and extensional regimes (Figure 4) (McClusky et al., 2003). This has resulted in the formation of back-thrust mountain ranges on the north and south sides of collision zone, developing the Betics and Rif, respectively (Vernant et al., 2010). Between these two mountain ranges is the Alboran Basin, which reflects active extension and subsidence (Vernant et al., 2010). The southern Rif mountain belt continues to trend east into the Tell mountain belt, which extends to Tunisia (Serpelloni et al., 2007). 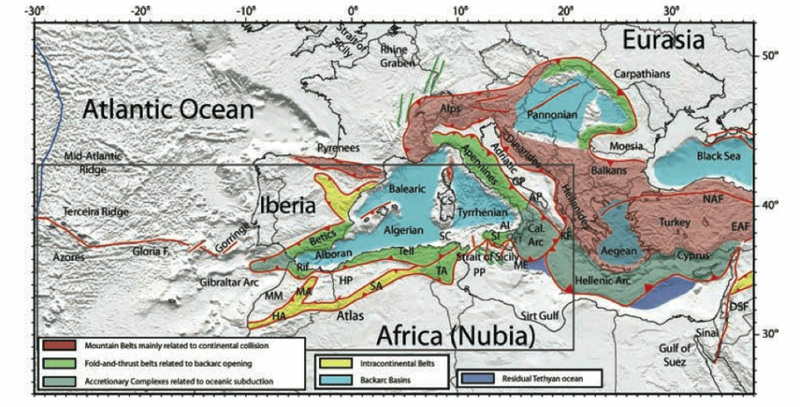 Figure 4: Tectonic overview of the Mediterranean region, illustrating mountain belts, accretionary complexes, faults, back arc basins, intercontinental belts, and the residual Tethyan ocean. These tectonic features are overlain on a modern day political map. The Betics and Rif are shown, with the latter extending into the Tell. MA: Middle Atlas, HA: High Atlas, SA: Saharan Atlas, TA: Tunisian Atlas, Cal. Arc: Calabrian Arc. From Serpelloni et al., 2007. Approximately 200 km south of the Betic-Rif region, the Atlas intracontinental high mountain belt originated in the Cenozoic due to the Alpine collision (Serpelloni et al., 2007). It extends from Morocco until it merges with the Tell mountain belt in Tunisia – both the Atlas and Tell run parallel to the coast of North Africa. 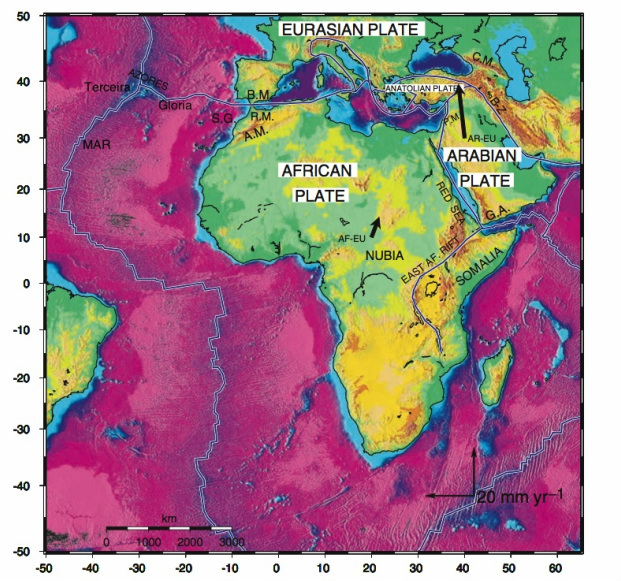 Shortening across the Middle to High Atlas represents the significant role that deformation played in the plate boundary evolution (Serpelloni et al., 2007). Eastward, the convergence of Nubia and Eurasia is illustrated by the shortening in the plate boundary in the Calabrian Arc and Sicily – Sicily is considered the northern edge of the Nubian plate (D'Agnostino and Selvaggi, 2004). Subduction is occurring along the Calabrian trench southwest of Italy (McClusky et al., 2003). Finally, this gives way to active subduction of the oceanic crust in the eastern Mediterranean along the Hellenic and Cyprus trenches, and the region between these two features (McClusky et al., 2003). Since ~3 Ma there has been a decrease in the convergence rate between Nubia and Eurasia and more pronounced oblique (NW-SE) motion between the two plates (Figure 5) (Calais et al., 2003). Figure 5: Kinematic boundary conditions between Nubia and Eurasia. Motion is oblique NW-SE. Displacement is shown with respect to the Eurasian plate in mm/yr. From Serpolloni et al., 2007. At the MAR, spreading is occurring at an average half rate of 12-13 mm/yr (Wang et al., 2011). Whereas, collision between Nubia and the Mediterranean is occurring at 8 ± 0.6 mm/yr in the eastern Mediterranean, which progressively decreases to oblique opening of 4 ± 0.6 mm/yr at the western plate margin (Figure 6) (Calais et al., 2003). The oblique convergence between Nubia and Eurasia is occurring in an approximate NW-SE direction (Vernant et al., 2010). Figure 6: Horizontal velocities given with respect to the Eurasian plate. From Serpolloni et al., 2007. 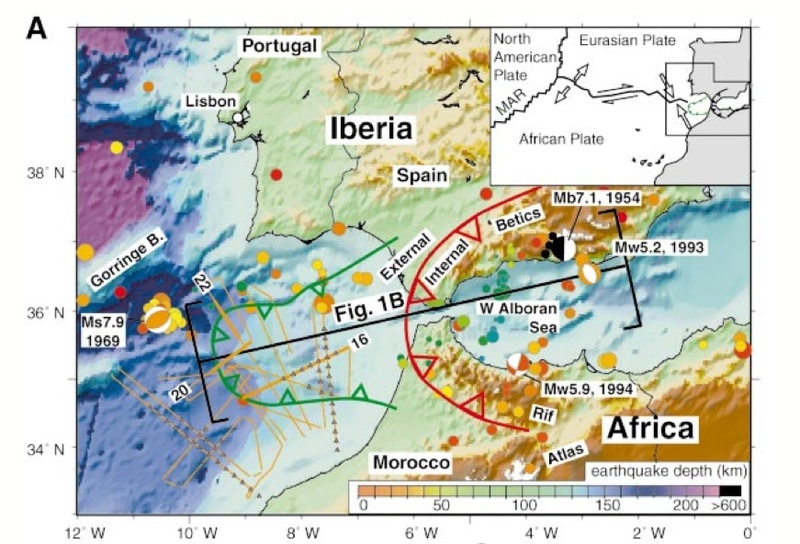 Eastward subduction may be occurring beneath Gibraltar from the Atlantic ocean down to below the Alboran Sea, which may explain the source of the 1755 Great Lisbon Earthquake (M>8.5) (Gutscher et al., 2002). As the Gibraltar Arc advances westward it drives compressional deformation of the Atlantis accretionary wedge (Figure 7) (Gutscher et al., 2002). The presence of an accretionary wedge is buoyed by the discovery of active mud volcanoes in the Gulf of Cadiz (Gutscher et al., 2002). However, at the present time, the evidence for this process is still tentative and debated (Vernant et al., 2010). Figure 7: The Gibraltar Arc (at the eastern end). This is a transpressional plate boundary between the Iberia and Nubia. Gibraltar Arc in red, and the Atlantis accretionary wedge. Circles represent earthquake depth (refer to embedded scale). An east-dipping slab of oceanic lithosphere is supported by the distribution of intermediate and deep-focus earthquakes. From Gutscher et al., 2002. 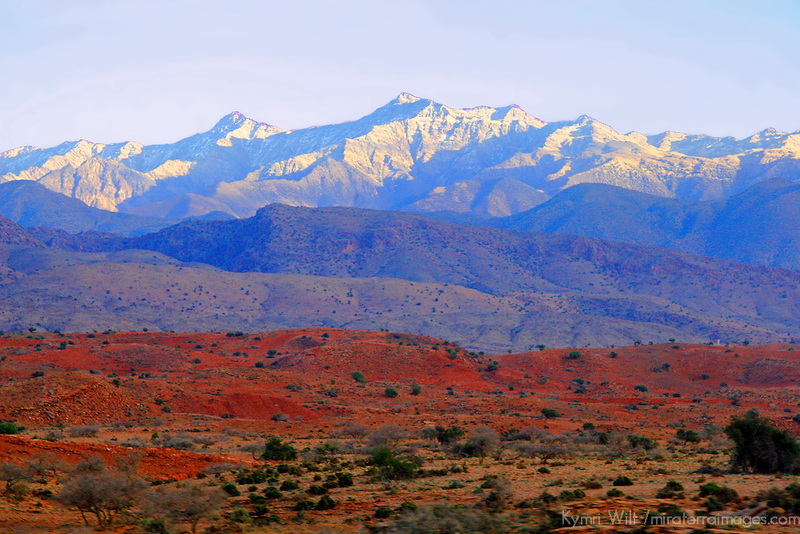 A large percentage of Africa’s lead and zinc production originates from its younger orogenic belts, such as in the Rif/Tell and Atlas mountain belts (Clifford, 1966). 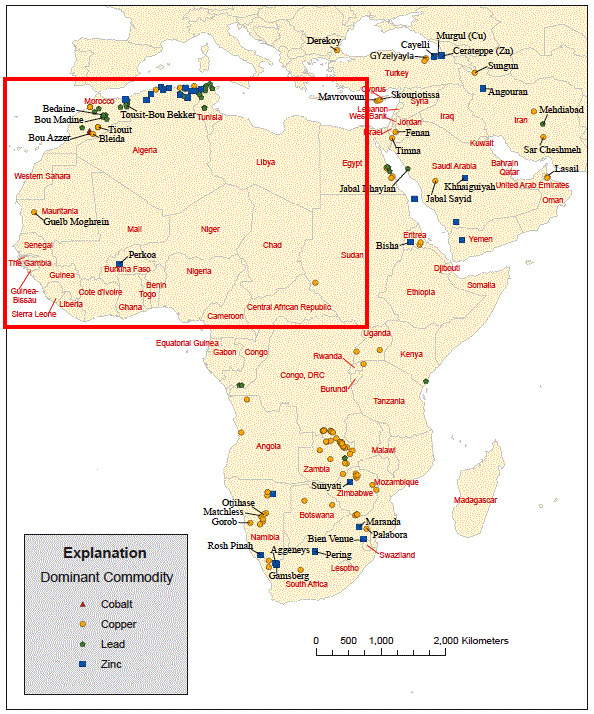 Furthermore, a respectable 7-8% of Africa’s cobalt originates from Morocco (Clifford, 1966). Iron is found in the Rif/Tell and Atlas mountain ranges, as well as on the southern edge of the West African Craton (Clifford, 1966). Emplacement of these resources occurred from the Palaeozoic through the Cenozoic (Clifford, 1966). Figure 8: Ore deposits of North Africa contained within the North West region of the Nubian plate (as demarcated by the red box). Shows the presence of zinc, lead, and copper in the younger orogens (i.e. the Rif and Atlas regions of North Africa). Cobalt is also present in this region. Modified after Clifford, 1966. Calais, E., DeMets, C., Nocquet, J.-M., 2003. Evidence for a post-3.16-Ma change in Nubia-Eurasia-North America plate motions? . Earth and Planetary Science Letters 216, 81-92. Clifford, T.N., 1966. Tectono-Metallogenic Units and metallogenic Provinces of Africa. Earth and Planetary Science Letters 1, 421-434. D'Agnostino, N., Selvaggi, G., 2004. Crustal motion along the Eurasia-Nubia plate boundary in the Calabrian Arc and Sicily and active extension in the Messina Straights from GPS measurements. Journal of Geophysical Research 109, B11402. Gutscher, M.-A., Malod, J., Rehault, J.-P., Contrucci, I., Klingelhoefer, F., Mendes-Victor, L., Spakman, W., 2002. Evidence for active subduction beneath Gibraltar. Geology 30, 1071-1074. McClusky, S., Reilinger, R., Mahmoud, S., Ben Sari, D., Tealeb, A., 2003. GPS constraints on Africa (Nubia) and Arabia plate motions. Geophysics Journal International 155, 126-138. Roest, W.R., Srivastava, S.P., 1991. Kinematic of the plate boundaries between Eurasia, Iberia, and Africa in the North Atlantic from the Late Cretaceous to the Present. Geology 19, 613-616. Schlüter, T., Trauth, M.H., 2008. Geological Atlas of Africa: With Notes on Stratigraphy, Tectonics, Economic Geology, Geohazards, Geosites and Geoscientific Education of Each Country. Springer. Serpelloni, E., Vannucci, G., Pondrelli, S., Argnani, A., Casula, G., Anzidei, M., Baldi, P., Gasperini, P., 2007. Kinematics of the Western Africa-Eurasia plate boundary from focal mechanisms and GPS data. Geophysics Journal International 169, 1180-1200. Vernant, P., Fadil, A., Mourabit, T., Ouazar, D., Koulali, A., Martin Davila, J., Garate, J., McClusky, S., Reilinger, R., 2010. Geodetic constraints on active tectonics of the Western Mediterranean: Implications for the kinematics and dynamics of the Nubia-Eurasia plate boundary zone. Journal of Geophysics 49, 123-129. Wang, T., Lin, J., Tucholke, B., Chen, Y.J., 2011. Crustal thickness anomalies in the the North Atlantic Ocean basin from gravity analysis. Geochem. Geophys. Geosyst. 12, 1-25. Zitellini, N., Gràcia, E., Matias, L., Terrinha, P., Abreu, M.A., DeAlteriis, G., Henriet, J.P., Dañobeitia, J.J., Masson, D.G., Mulder, T., Ramella, R., Somoza, L., Diez, S., 2009. The quest for the Africa-Eurasia plate boundary west of the Straight of Gibraltar. Earth and Planetary Science Letters 280, 13-50.